Question of the Week: If You Could Reform only One Major Entitlement Program, Which One Would You Pick? I obviously want comprehensive reform of all entitlement programs, so selecting just one is a bit of a challenge. Sort of like being asked to pick your favorite kid. Would I reform Social Security? That’s a logical choice. It’s the biggest program in the federal budget, so it’s presumably the biggest problem. And it sure would be nice to have personal retirement accounts, just like Australia, Chile, and other nations that have modernized their systems. 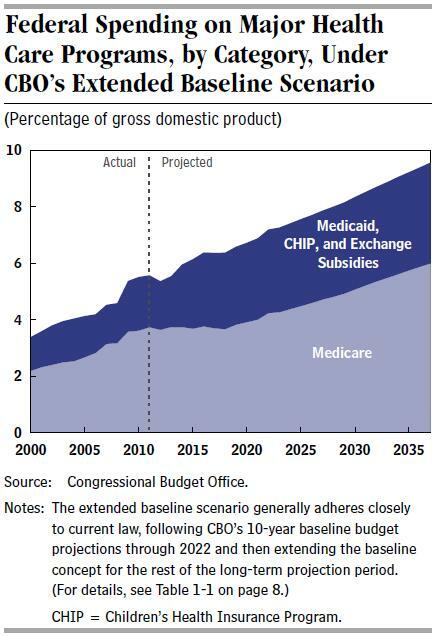 But Medicare and Medicaid are growing faster than Social Security and the Congressional Budget Office projects that those two entitlements eventually will become a bigger burden on taxpayers than Social Security. And since our goal should be to minimize the long-run burden of government spending, that suggests that it’s more important to reform the healthcare entitlements. But which program should be fixed first? There’s certainly a strong case to deal with Medicare. The health program for the elderly already is very expensive and it’s going to become even more of a budget buster because of demographic changes. Moreover, shifting to a “premium support” system would be good for seniors since they would have the ability to pick a plan best suited to their needs. Basically the same type of system now available to members of Congress. All things considered, though, I would deal first with Medicaid. There are three reasons why I would target the health program designed to supposedly help the poor? Medicaid is hugely expensive today and will become even more costly over time. The block-grant reform proposal is a good first step for restoring federalism. Obamacare can be partly repealed by block-granting the exchange subsidies as part of Medicaid reform. For more information, here’s my video explaining how to reform the program. I’m not going to cry – or even complain – if politicians instead decide to fix Medicare or Social Security. Just so long as they’re taking steps in the right direction, I’ll be happy. What I don’t want to see, however, is a gimmicky plan such as Simpson-Bowles that merely papers over the underlying problems for a couple of years. The wrong type of entitlement reform is probably worse than doing nothing. As part of the silly budget debate in Washington, President Obama is claiming that an increase in the debt limit wouldn’t authorize higher spending. That’s technically true, but it sure would enable higher spending. 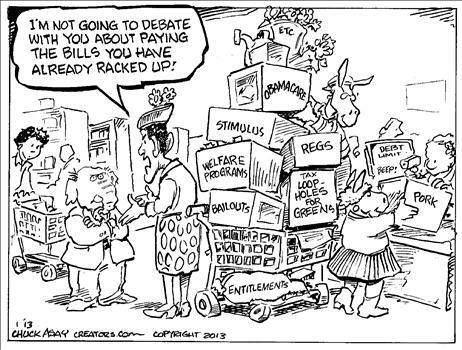 This Chuck Asay cartoon offers an amusing perspective on the battle. In the interest of accuracy, however, it should show President Bush having already gone through the checkout line with an equally big cart full of handouts. After all, government spending imposes a heavy cost on the economy regardless of whether Republicans or Democrats are the ones in charge of policy.